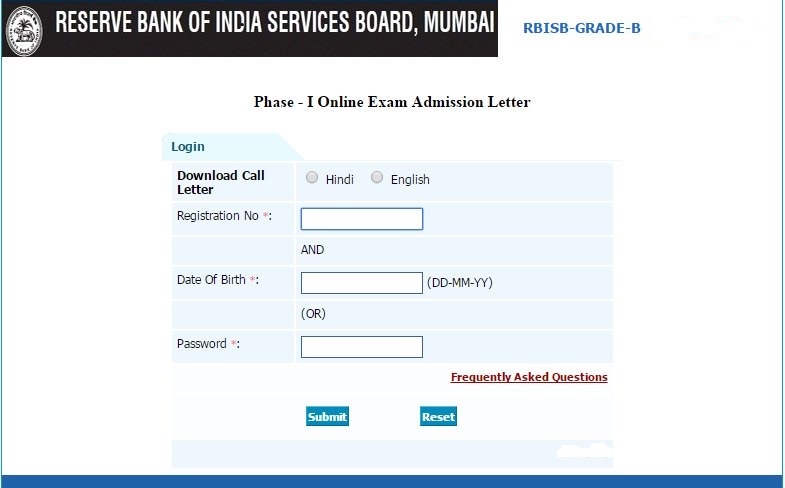 Release Date: RBI Grade 'B' 2019 Exam Admit Card will be released 15 days prior to the date of examination. The expected release date for RBI Grade 'B' admit card is 1st June 2019. Issuing Authority: RBI Grade B 2019 Admit Card will be issued by the Reserve Bank of India. Exam-wise issue: The Hall ticket/Admit card will be issued online on the official website of RBI. For every phase of RBI Grade B 2019 exam a separate Admit card will be generated. Firstly, the admit card/hall ticket for the preliminary exam will be released, candidates qualifying the phase I exam will be issued the hall ticket for the main exam. Finally, candidates qualifying the Main exam will be called for an interview and will be provided an Interview call letter. Credentials required to download: Applicants can visit the official website of RBI and download their hall ticket by entering their Registration Number/ Roll Number and Date of Birth/ Password in the login Panel. Note: It is a must for candidates to download and carry the Admit Card/Hall Ticket with them on the day of the examination as without the same they will not be allowed inside the examination hall. Admit Card/ Hall tickets for all phases of the exam will be released online on RBI's official website. Candidates must note that the admit card will not be sent via post or on email. Step 1: Candidates need to visit RBI GRADE 'B' official website. Step 2: For downloading the RBI Grade 'B' 2019 Admit Card, candidates are required to enter their Application Number and Date of Birth as the password. Step 3: Click on the 'Submit' button to download the Admit Card. Take a printout of the same for future reference. Note: On the day of examination, candidates must bring the hard copy of the RBI Grade 'B' Admit Card along with an original ID proof to appear for the exam. RBI Officer Grade B Admit Card of Phase I will be provided to those candidates who are eligible for the Exam. RBI Officer Grade B Admit Card of Phase II will be issued to those candidates who get shortlisted for Phase II exam after qualifying the Phase I exam. RBI Officer Grade B Admit Card of Interview or call letter will be issued to those candidates shortlisted for the interview round and same will be sent to the candidate's e-mail ID. Once candidates obtain the print-out of their Admit Card/ Hall Ticket, they must verify all the details on the same. In case they come across any mistakes in the details, the same must be communicated to the RBI officials at the earliest. Candidates must carry the following documents along with them on the day of the examination for verification purpose. RBI Grade B 2019 Admit Card. Valid government photo ID proof (Passport, PAN Card, Driving License, Voter’s Card, Bank Passbook with Photograph, College ID card, Aadhar Card, Employee ID, Bard Council Identity Card with photograph). Passport-size colour photographs similar to the one uploaded during registration. A ball point pen should be brought to the exam centre by the candidate. Candidates will be provided rough sheets at the exam hall and once the exam is over, these sheets must be returned to the invigilator. Stationery items like textual material, geometry/ pencil box, writing pads, plastic pouch etc will not be allowed inside the examination hall. No electronic devices such as a calculator, pen drives, log table, electronic pen/ scanner etc. will also not be allowed inside the examination hall. Candidates have to sign the admit card or put their thumb impression on the Admit Card in presence of the invigilator. Candidates must carry one photo identity proof such as passport, Aadhar card, PAN card, driving license, voter Card, bank passbook etc. They will be required to paste a similar passport size photo on the admit card. Candidates are advised to reach the examination centre well before time of commencement of exam to avoid any last minute hassles.